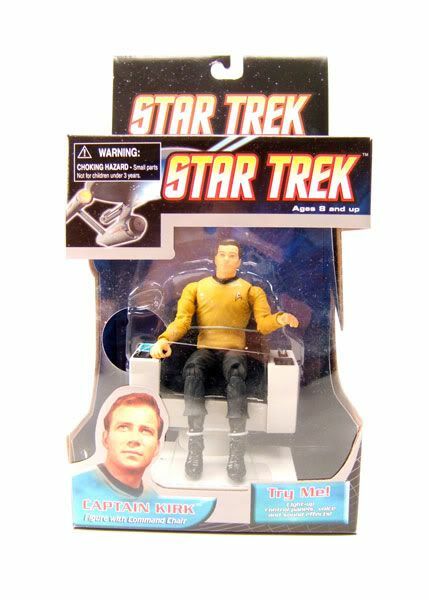 Diamond Select Toys went back to the well again and released this Kirk with Command chair as a boxed single release. 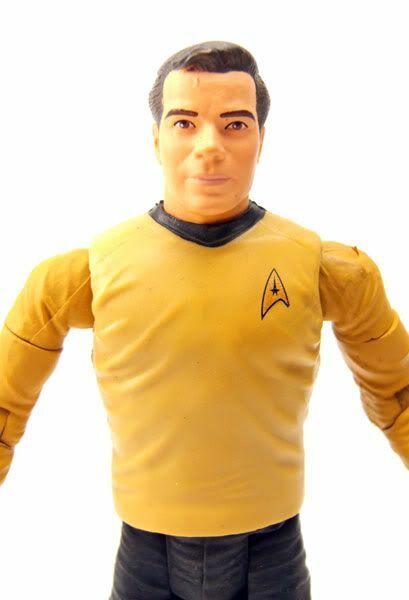 The Kirk is your current standard Diamond Select version. Pretty similar to the recent single carded rerelease, and I'm sure we'll see the same in the upcoming 2 pack. 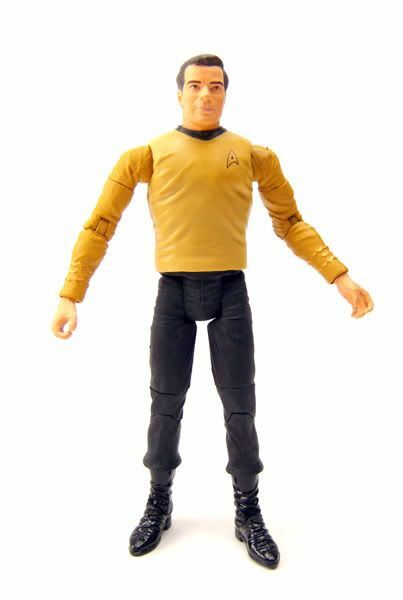 The highlight of this figure is the pants and boots. The paint choices DST made are perfect. The boots are a shiny contrast to the flat color of the pants. In my opinion, a much nicer job than the original AA release. Onto the chair... The chair is pretty much the same sculpt-wise as the previous releases. 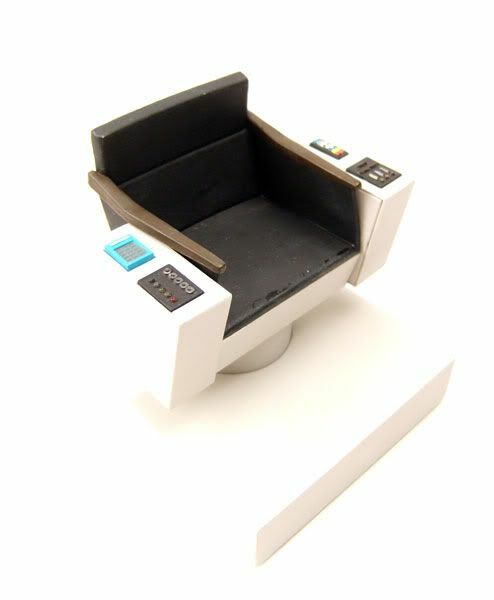 It's a really nice, screen-accurate version of the chair. This release, however, has the added bonus of electronics! Press the blue panel on Kirk's right, and you'll get speech clips and the panels will light up! Press the panel again and again to hear classic Shatner lines! 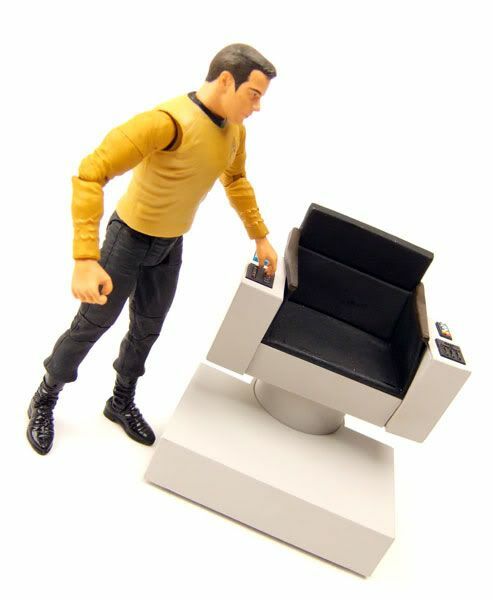 Press the switches panel on Kirk's left and you'll get sound effects and lights! 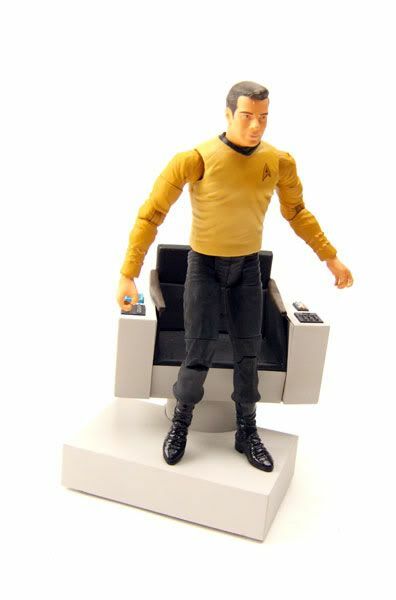 Voice clip- "Position Report Spock"
Voice clip- "Prepare to attack, all hands battle stations." 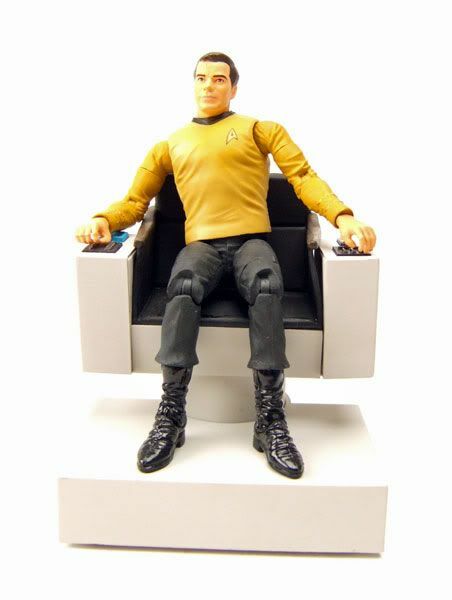 Voice clip- "Chekov arm photon torpedoes"
Voice clip- "Resume course to our next detination Mr. Sulu"
Voice clip- "This is Captain James Kirk of the USS Enterprise"
Voice clip- "Lt. Uhura open a channel to all decks"
Voice clip- "Security alert to all decks, Kirk out." Voice clip- "Kirk to engineering; Mr. Scott- report." So, yeah there's alot of sounds on this thing. The panels light up pretty well too, but the paint on them is a bit sloppy. Still, if you're only going to buy one standard chair, this is the one to get. The Kirk is pretty good, an the chair is awesome. $2200!!! Gene should come in here and chop this thing up! Don't forget... if you hold down the "speech" button for 5 seconds, you'll get the entire opening monologue of the show, sans music. Hold down the "FX" button, and you'll get continuously looped bridge background sounds. otaku5003- James, I was actually planning on sculpting bridge components for the DST scale figures.